Max takes a few verses and fact that I’ve known my entire life and turns them on their head–how can I complain about being “plain” when the Savior of the Universe chose to not be physically attractive? How easily that one little passage opens up a whole litany of thoughts! 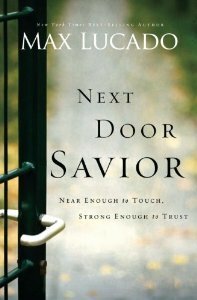 The entire book is full of gems like this–facts about our “Next Door Savior” that we all need to stop and look at with fresh eyes! Once again Max does not disappoint, I love his books and would highly recommend this one especially! Previous Previous post: It’s a Treasure Hunt!